To subscribe to our events announcement email list, write to issa@berkeley.edu. ANNOUNCING A NEW SCHOLARSHIP: Together with his family, Michael Davis — a 2013 graduate of Celtic Studies — has set up an annual $1,000 scholarship for Celtic Studies students: the Scotty Ross Memorial Scholarship, named after a family member. The scholarship is open to more than just Celtic Studies majors and minors (although majors will get priority). For 2018-19, the application deadline is May 1, 2018 and the award will be posted before next fall’s assessed fees. Click here for details. All are welcome; there is no registration fee. The program can be found here. For conference updates, subscribe to our events announcement email list by writing to issa@berkeley.edu. Volume 3: Treibh – Bealtaine. Volume 2: Treibh – Imbolc. Press Release: Celtic Studies minor Brennan Fahselt and Celtic Studies alumna Renata Rua were were presented with 2016 Gaeltacht Summer awards to study Irish language in Galway, Ireland. Read the press release here. An interview with Professor emeritus Dan Melia about St. Patrick’s Day [9 Mar 2016]. 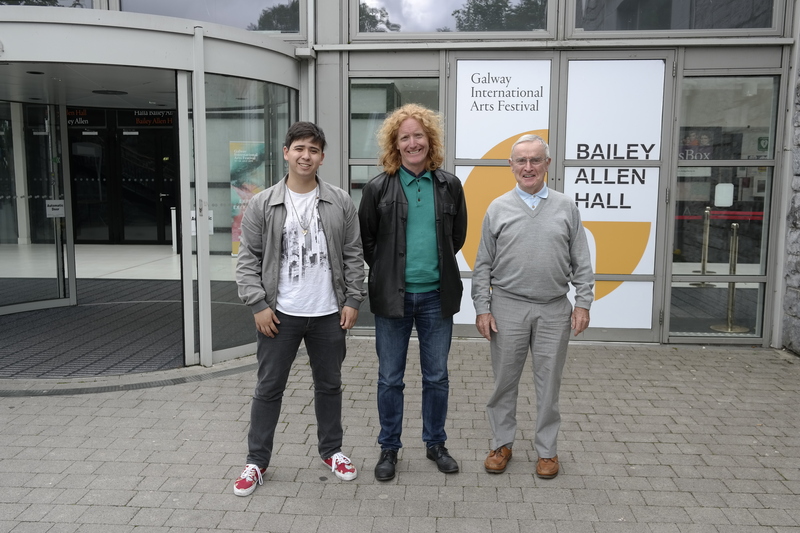 The Irish Studies Program of the National University of Ireland awarded two scholarships to Celtic Studies Program students Tony Coyle and Tim Hill. See photo here. Press Release: 3 UC Berkeley Celtic Studies students — Dylan Cooper and Andrea Eberle, Celtic Studies majors, and Alessandra Moyer, Irish language student — were presented with Summer Gaeltacht Awards to study Irish language in Galway, Ireland. Read the press release here. See photos here. Presented by the Irish Studies Program, Institute of European Studies. November 1, 2017: Samhain Celebration. 5:30-7:30pm. English Department Lounge, Wheeler Hall, 3rd Floor. Presented by the Celtic Studies and Irish Studies Programs at UC Berkeley. Click for further details. Duncan Campbell, recipient of the 2014 Turner Prize, will show his latest film “The Welfare of Tomás Ó Hallissy” currently exhibited at the IMMA (Irish Museum of Modern Art). Panel discussants: Duncan Campbell, Nancy Scheper-Hughes, Paul Hockings. An Evening of Stories for Eddie Stack (1950-2016). October 27, 2016. Eddie Stack, a beloved teacher and friend, admired writer, and talented musician, left us on July 4, 2016. The Program in Celtic Studies at UC Berkeley, together with the Irish Literary and Historical Society of San Francisco, propose to hold an evening of story-telling in his memory. 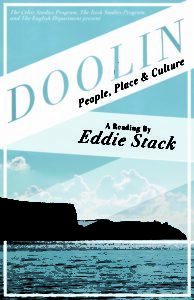 Stories about Eddie, stories we heard Eddie tell, stories Eddie would have liked.Scheduled presenters will include Robert Tracy (Professor Emeritus, Department of English), Thomas Walsh (Celtic Studies Program), Jamie Stack, and some of Eddie‘s Irish language students. Hell No, We Won’t Go: Irish America’s Role in Defending the North of Ireland Vote to Reject Brexit. October 31, 2016. Máirtín O’Muilleoir, Finance Minister of Northern Ireland. More information here. A Poetry Reading by Trevor Joyce. November 1, 2016. More information here. 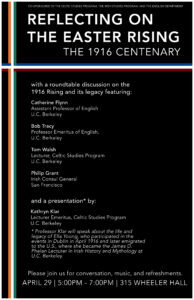 Film Screening and Panel Discussion: “Reframing 1916”. November 17, 2016. More information here. Reflecting on the Rising: The 1916 Centenary. Friday, April 29, 2016. 3:00pm, Maude Fife Room/315 Wheeler Hall. 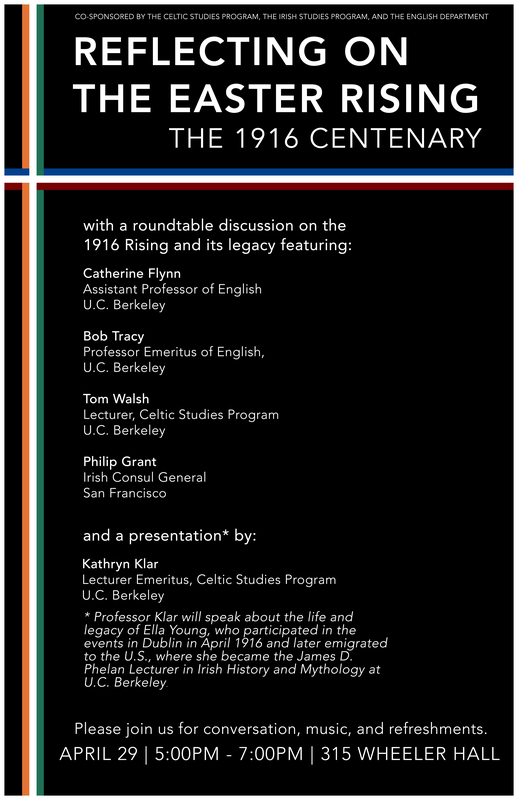 A roundtable discussion of the 1916 Rising and its legacy by UC Berkeley faculty and invited guests. Read more here. 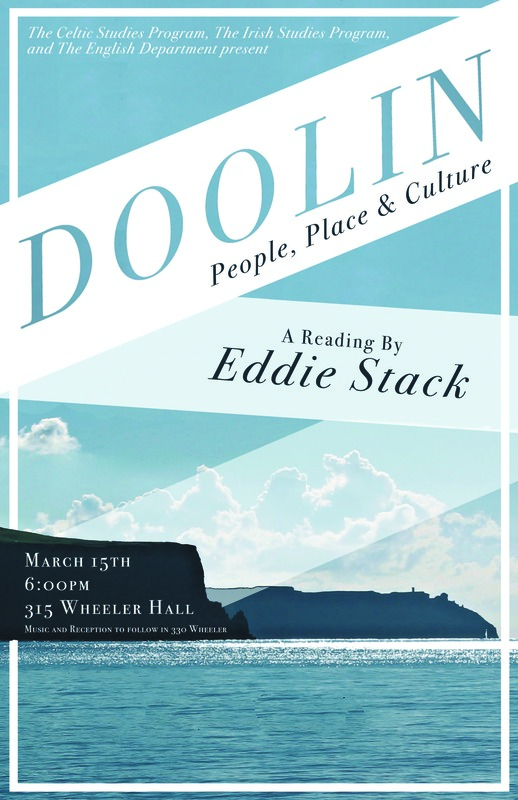 A Reading by Eddie Stack. Tuesday, March 15, 2016. 6:00pm, Maude Fife Room/315 Wheeler Hall. 38th Annual University of California Celtic Studies Conference: UCLA, March 10-13, 2016. November 3, 2015. Read more here. President of Ireland Michael D. Higgins: “Ending Global Hunger and Eliminating Poverty: Is It Possible?” October 26, 2015. “The Critical Importance of Less Commonly Taught Languages” Celtic Studies lecturer Kathryn Klar is a featured speaker. October 16, 2015. B-4 Dwinelle Hall, UC Berkeley. 3-5 pm. “Facing the Music: Public Imperatives in Seamus Heaney’s Late Poetry/Noli Timere: Reflections on the Life and Work of Seamus Heaney,” Professor Michael Parker, October 6. Conference: Post-Print Manuscript Cultures in Ireland, Scotland, and Iceland. September 10-11, 2015, Ulster University, Derry. For speakers, talks, and more, read the program here. See poster here. “The Musical Responses to the Poems of Ossian”, Professor James Porter, April 15, 2015.
International Congress of Irish Studies, 3rd Conference, March 17, 2015. California Celtic Conference & Celtic Studies Association of North America 2015, March 5-8, 2015.